In 2009, when Keating and Caroline Crown were looking for a home in Chicago, their agent, Jeff Lowe, showed them an interesting building that happened to sit next to an unused elevated railroad line. Hundred-year-old retaining walls and crumbling viaducts supported a neglected, overgrown corridor of land that extended nearly three miles. To someone other than Keating Crown that might have sounded crazy. Or impossible. But he and Caroline had just returned to Chicago from New York City, where they saw firsthand how the High Line—one of the most famous “rails-to-trails” projects in the world—had transformed the west side of Manhattan Island. Crown understood what was possible. And he decided that he was going to help make it happen. According to the Trust for Public Land, a national nonprofit organization that works with local communities to build parks and promote land conservation efforts, there are more than 100,000 miles of unused rail line across the United States. In urban areas particularly, these lines present a unique opportunity for the creation of parks and green spaces that connect neighborhoods in interesting ways and can serve as alternative transportation corridors for pedestrians and cyclists. New York City’s High Line was built on an elevated New York Central Railroad spur that once serviced the factories and warehouses on the lower west side of Manhattan. Unused as a rail line for decades, it was slated for demolition in the 1990s, until a handful of neighborhood residents began to advocate for its repurposing as a public space. By the Fall of 2014, when the third and final phase of the High Line opened to the public, the park had an estimated 5 million visitors annually. It is widely praised for both its utility and its beauty. 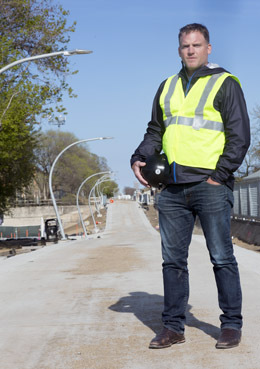 Leating Crown (JD-MBA '11) on the Bloomingdale Trail during construction, April 2015. Residents in Chicago’s Bucktown, Humboldt Park, Logan Square, and Wicker Park neighborhoods had the same idea: convert the unused train tracks known as the Bloomingdale Line into an elevated linear park that would give children living nearby a place to learn and play, the neighbors a place to walk their dogs and stroll on sunny days, and bicycle commuters an alternative to traffic-congested streets. Converting the Bloomingdale Line into a recreational trail was an attractive idea with widespread popular and political support. 80,000 people live within a ten-minute walk of the line—a number that includes 20,000 children. The neighborhoods it crosses do not meet city or national minimums for open public space. It was a key piece of the 2003 Logan Square Open Space Plan, which Mayor Richard M. Daley intended as a blueprint for expanding and enhancing parks and public spaces on Chicago’s northwest side. Residents formed Friends of the Bloomingdale Trail, and began building a coalition of stakeholders to move the project forward. Mayor Rahm Emanuel embraced the project during his 2011 campaign, and his commitment has never wavered. But conversions of this type are complicated. Early on, advocates reached out to the Trust for Public Land for help. “Friends of the Trail approached us about nine and a half years ago, in part because of the work we did on Haas Park in Logan Square,” said Beth White, Director of the Chicago Region for the Trust for Public Land. There were legal, regulatory, and ownership issues that had to be resolved. The land was privately held, but the complicated network of laws governing rail line rights-of-way meant that the land transfer had to be carefully structured. Because the line was unused, it was something of a public nuisance. The owners didn’t police the property—and there were things going on up there, not all of them above board—but law enforcement had limited jurisdiction because the land was privately held. White and her colleagues at the Trust for Public Land worked with city managers and the company that owned the land to broker the deal. “We went through a very long process to get the rail line legally abandoned so the land could be repurposed. It’s a Federal process, and a complicated one, and the owner didn’t want to undertake that process unless they could be sure the trail project was going to move forward,” White explained. In the end, the company sold the land to the people of Chicago for one dollar. The pieces were falling into place, but many things still needed to happen in order for the project to move forward. One of the most important of those was the funding. With an estimated budget of $95 million, the money to build the 606 comes from multiple sources. The Chicago Park District and the Chicago Department of Transportation have made significant investments. Federal public infrastructure funds are also part of the mix. For example, the hundred-year-old viaducts that supported the Bloomingdale Line are important through-ways in some of Chicago’s most densely populated neighborhoods, and they were in need of repair. The Chicago Department of Transportation sought and received a $40 million federal grant to restore the thirty-eight viaducts along the line. As a member of the 606 Leadership Council, Crown has worked to do just that—leverage existing commitments and resources into broader support for the project. As fundraising co-chair, it’s his responsibility to secure philanthropic support from the private and corporate sectors. His pitch to potential corporate partners is straightforward: this project will make Chicago a better city in which to live and work, and that is good for your business. Corporations including Boeing, CNA, and Exelon have made substantial contributions to the project. After ten years in the financial sector in New York City, Crown returned to Chicago to enter the JD-MBA program at Northwestern Law. Now, as a Principal at the Chicago-based real estate development firm Sterling Bay, he focuses on adaptive reuse conversions of functionally obsolete buildings. Sterling Bay primarily focuses on Chicago’s Fulton Market, where the company has several high-profile projects and has been credited with significant contributions to the economic redevelopment of that neighborhood. His civic commitments also include serving on the Board of Directors for the National September 11 Memorial, a cause important to him because he is a survivor of the 2001 attack on the World Trade Center. With the elevated Bloomingdale Trail as its centerpiece, the 606 joins an extraordinary legacy of great parks in Chicago. Phase One of the project—the Bloomingdale Trail and four of the connected ground-level parks—opened June 6, 2015. Additional parks, a mile and a half of nature trails, educational programming, and art installations will follow in subsequent phases. Jean Linsner, the Exelon Fellow at the Trust for Public Land, is working with local schools and other Chicago nonprofit organizations to leverage the 606 as an outdoor classroom. Plans are also in the works to extend the 606 further east, to connect it with the North Branch of the Chicago River. This article was written by Kirston Fortune and was originally published in the Spring 2015 issue of the Northwestern Law Reporter.